Booking a specialised photographic safari in the Sabi Sabi Private Game Reserve allows you the opportunity to concentrate on photographing the animals, comfortable in the knowledge that the other guests around you are as keen to capture the perfect shot as you are. 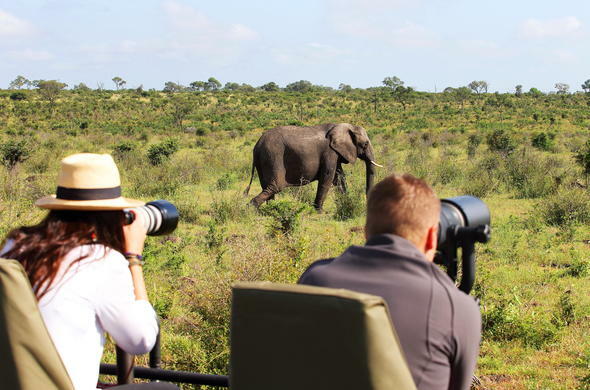 The Sabi Sands Private Game Reserve is known for its incredible diversity of African wildlife and its wonderful up-close encounters with both small and large game animals. For those travellers who have specific passion for photography and want to try their hand at capturing stills of Africa's most beautiful wildlife, a specialised photographic safari is the ideal safari for you. Specialised photographic safaris are tailor-made with the emphasis on waiting for the perfect lighting, angle and ultimately the perfect shot. Where normal safaris have to take in different guests needs, moving on from one sighting to another, sometimes fairly quickly, to ensure that all the guests are happy and have had a chance to see the animal up-close, on a specialised photographic safari one may find oneself sitting at a particular sighting, sometimes of hours, waiting patiently to capture the best photographic opportunity. Highly trained and enthusiastic guides silently manoeuvre the vehicles through the bush, aiming to angle the vehicle in the best angle possible while trying not to disturb the Lion as is drinks contentedly from the watering hole, or sleeps quietly in the shade of a tree. To add to the perfect collection of elements to ensure you are able to get the most out of your photographic experience, a specialised photographer will also be on hand to help you with setting up and taking your photograph, assisting you every step of the way.The professional photographer will guide you during your safari, teaching you about the intricacies of the angles and lighting and helping you to get the best out of your camera and the animal in front of you, to help you get the best, once in a lifetime, perfect wildlife shot. Prior to your arrival at the safari lodge, the professional photographer will contact you to ascertain the level of your experience and interest in photography and you can spend some time discussing any specific shots you are hoping to get while on safari. If you are specifically aiming to capture a Giraffe drinking or a Leopard in a tree then you can let the photographer know. The professional photographer will also request a list of all the equipment you have access to and have been using so that he/she can tailor make the experience to suit your equipment, providing additional lenses or other equipment where necessary. As your time on safari draws to an end, you will be able to spend time with the professional photographer, reviewing all the images you have taken and they will be happy to take you through the different methods used on post-processing software and the merits of doing so. Then it is time to head home, with wonderful memories and a CD or flash disk filled with all the magnificent wildlife shots you have taken.